It's TGIF Day; "Thank Goodness It's Finished"
This little pouch, which is a prototype, certainly came with it's fair share of headaches as I learned to deal with the peculiar characteristics of hand stitching on silk, see my post of (Feb.10, 2014), but now that it's finished, I have forgiven it all it's obstinate idiosyncrasies and am looking forward to more projects with silk in the future. The little phone pouch, finished and set to travel. 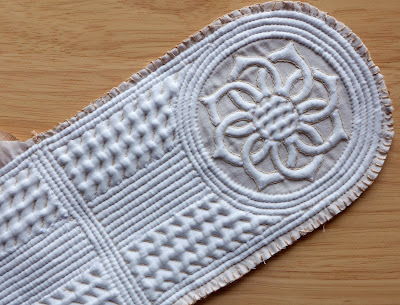 Once the boutis piece had been blocked, it was trimmed leaving a generous 1 inch seam allowance around the perimiter. 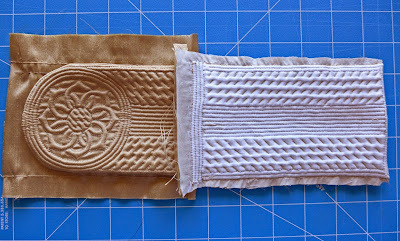 Next I cut a facing piece to the identical size as the stitched piece. I opted to make the facing from the same silk fabric that I used on the pouch itself. 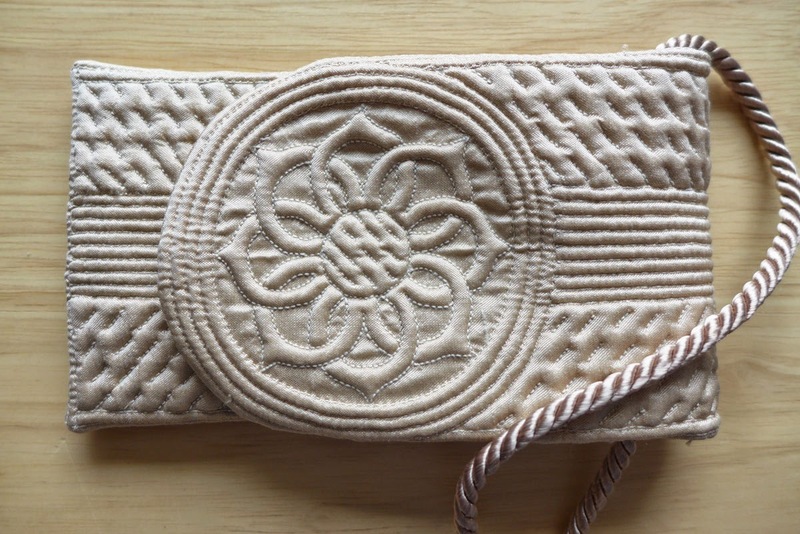 There are 3 sections to this pouch: from right to left - the front flap closure, the middle section (or what will become the back of the pouch), and the last section, (which will be under the front flap). The middle section and the last section become the actual pouch pocket. The wrong side of the front flap. This shows the underside of the front flap with the right side out. 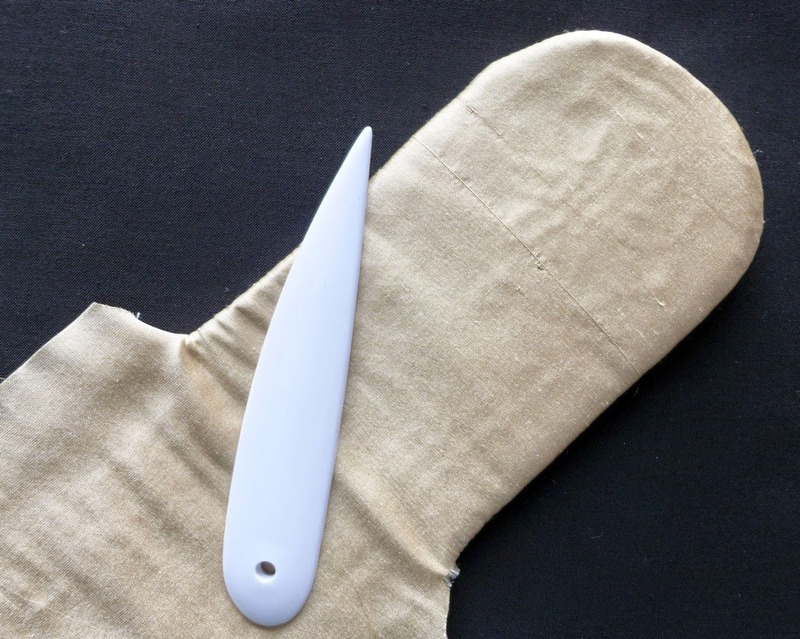 A point turner is necessary to get the side edges as crisp as possible and the rounded edge smooth. Step 2. 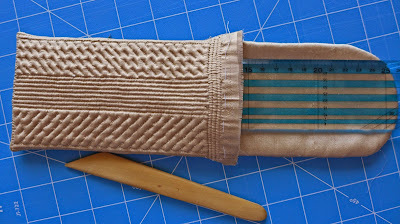 Next up was making the actual pocket of the pouch. 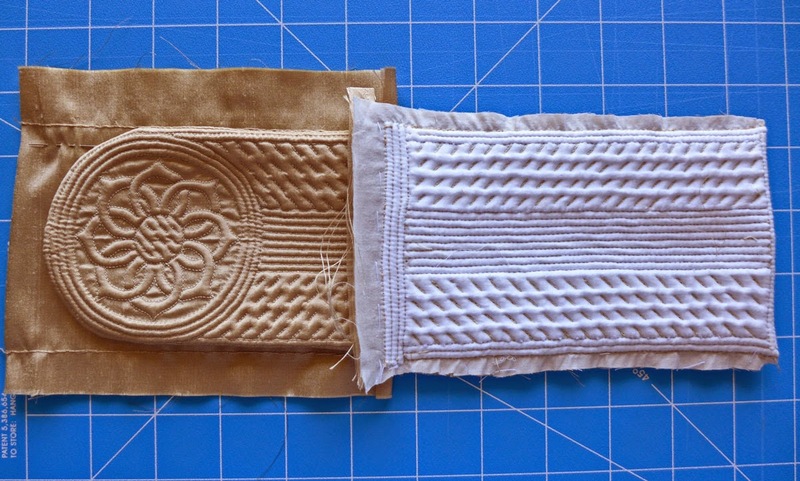 The two remaining sections of the worked boutis (middle section and last section) were stitched to each other, right sides together, on either side, leaving the top end open. 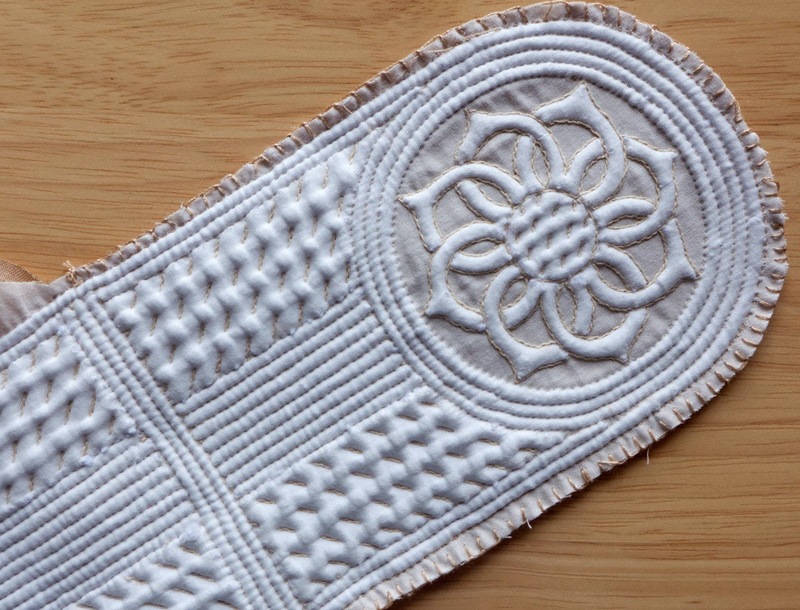 Next the remaining 2 sections of the lining were stitched together in the same way to a size that would fit into the boutis pouch. 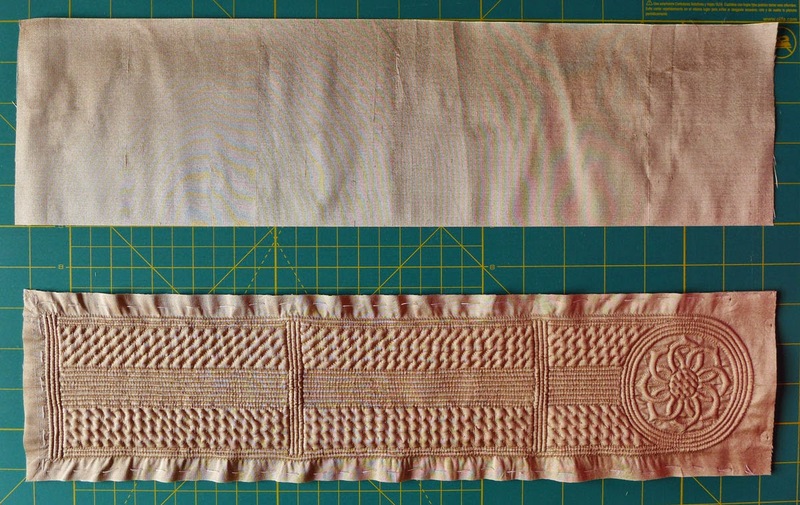 The excess fabric was trimmed to a 1/4". 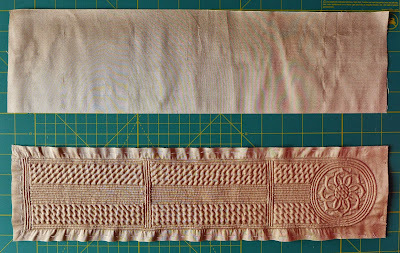 I chose to do all of the assembly by hand using a back-stitch, but it could very easily have been done by machine. To tuck the lining into the boutis, I found a wide ruler very helpful. Step 3. 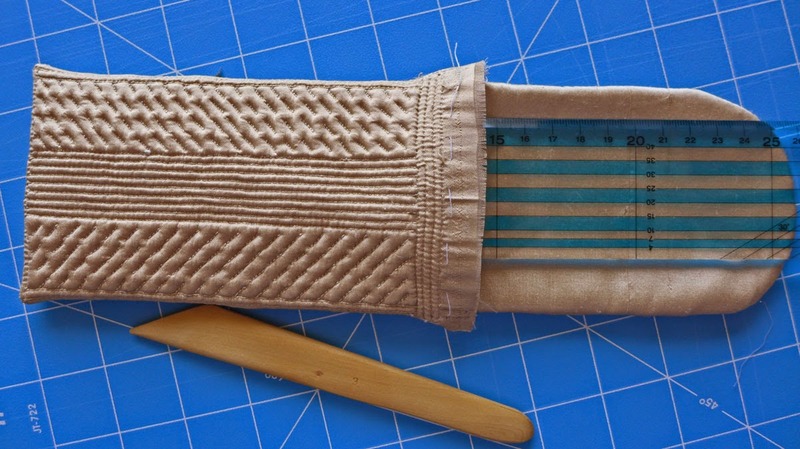 The open ends of the top of the pouch were tucked in and closed off using a tiny blind hem stitch. The finished boutis phone pouch. Even though there were frustrations in the process, I am quite happy with the overall look of the boutis on silk, and am looking forward to working out some of these kinks in my next silk boutis piece. That is one lucky phone!! Love it. It turned out very elegant. 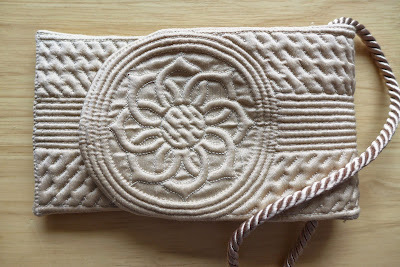 I've been thinking of making a dressy bag for weddings and such, and your technique might just fit the bill. Thanks for posting about it. I'm glad that you found my post helpful. 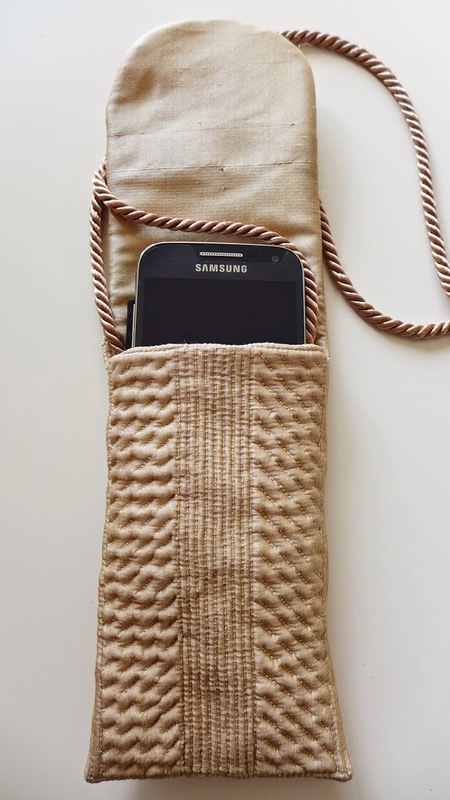 I have a design in the works for an evening bag similar to this phone pouch, just a little larger. It's actually designed specifically for a bride, but could easily be adapted to a more "generic" bag. I'll put up a post when I get back to it. Just gorgeous, so elegant and lovely. If you make it just a bit larger it would make a very nice bag for dressy occasions, just holding a phone, lipstick and a bit of cash. Love it! Thanks Cynthia. You're absolutely right about making it into a dressy bag. It's already in the works. (See my comments above to Kitchener Quilter). It's gorgeous! I imagine it makes you very happy every time you reach for your phone. And you'll likely receive many compliments when you're out and about with it in the future. Thanks Michelle. Now I just have to answer my phone when I'm out and about. (I miss a great many calls because I can never hear my phone ringing.) Maybe a cow bell ring would do the trick? I miss most calls, as well. Half the time it's because my ringer is off and the other half is because I simply don't hear it. Thank goodness I don't actually get that many calls! Oh....this turned out exquisite! The imperfections you speak of DO NOT show. Thank you so much for sharing your process. It makes me want to get some silk and start a project! You are very kind, but it's all of the little irritations that jump out at me when I look at the bag. I'll just have to get started on another one soon, to correct the error of my ways. I think it might be the evening bag. What a gorgeous finish! And a truly wonderful design - just the right balance of detail. I'm sure the larger bag will be a stunner too. Congratulations! Thanks so much. I'm happy to see you're back! It's adorable!! Great idea to use silk! So classy! Wow - what a nice little bag for a phone. I'm always interested in reading about boutis! There isn't anyone in my area that does it but me. And I can't seem to get enough of it from books. I'm such a beginner but absolutely love it. I wish there were classes to take in my area. Thanks for all your info and I totally appreciate your sharing with us. Hi Karen. It's always great to meet other boutis enthusiasts. I also don't know of anyone near me, when at home in Canada, that does boutis. There are many books on boutis, but they are not easily available in North America and almost all of them are written in French. I'm currently working on a few simple boutis designs that I will make available through my blog. The kits will include basic instructions and directions. Until then, I will continue to post my latest adventures with boutis. I'm so glad that you stopped by.